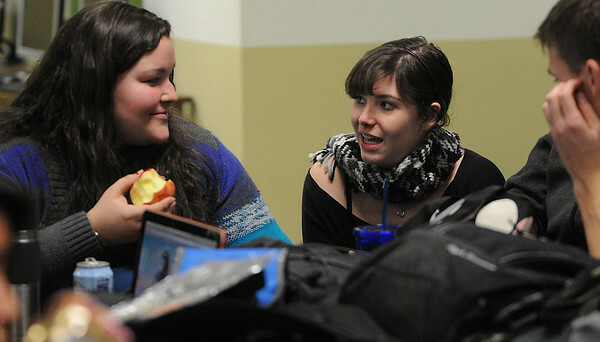 Honor Baslim, left, a senior, and Alison Palmer, a 2010 graduate who is currently enrolled at American University, talk in the Salem Academy Charter School cafeteria. Salem Academy Charter School hosted an Alumni Event on Thursday. Returning graduates hosted a panel for 11th and 12th grade students, who got a chance to ask questions of the graduates about what they have been doing since they’ve graduated. Photo by Ken Yuszkus/Salem News, Thursday, January 6, 2011.